When Nintendo introduced Labo, the adorable toy-craft add-on for Nintendo Switch, most people thought it was a fun diversion for the kids. Now, Nintendo has released a full-blown VR experience that the user builds out of the Labo Toy-Con kits. How does it stack up against dedicated VR? The most notable departure from standard VR experiences here is that you have to build the entire VR device yourself. From cardboard. If you love arts and crafts, this is quite a fun experience. If you’re not as big on the paper-craft, this might be a bit of drag for you. 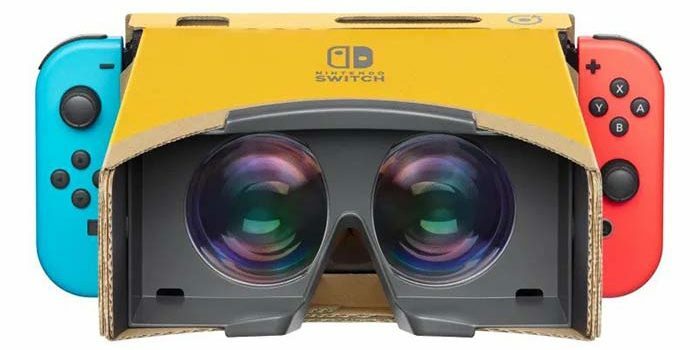 In either case, it doesn’t take too long to build your own VR headset that your Switch tablet slots straight into. There are tons of other “Toy-Cons” that you can build out of the kit, too. It’s all delightfully fun and simple, and the on-screen “Build” mode walks you through the process step-by-step. While dedicated hardware is going to be putting out more impressive visuals than the Switch, it’s downright charming to use the “Play” mode of Labo VR. Inventive and creative uses for the technology abound, transporting the player to the fun-filled world of Nintendo in no time at all. Various, silly controllers like a blaster with real kick-back (thanks to some rubber bands and cardboard) and a camera that makes a fun zoom-in, zoom-out sound, make the VR tactile. It feels so real and immersive to fire grenades at goofy aliens in the Blaster game. For $80 you can get all of the Toy-Cons and software needed to play with Nintendo Labo VR. It’s a fun experience, made all the better by the joy of building silly cardboard controllers. Is it going to blow away die-hard fans of the Oculus Rift? Maybe not. But the inventive controllers, fun building aspect and downright charming games all make this the most user-friendly VR experience to yet hit the market. If anyone can sell the odd experience of VR to a mass-market, it’s Nintendo.